Ben 10 is a Cartoon Network cartoon series that has spawned several additional series and movies. Ben 10 Alien Swarm is one such movie that was done in live action and has one online flash game related to it on the Cartoon Network website. 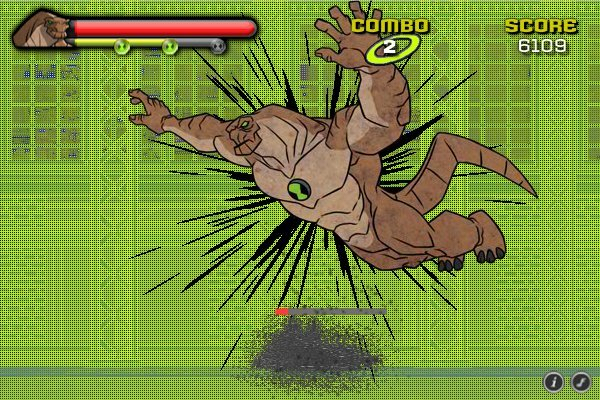 This game is Ben 10 Alien Swarm: Swarm Smash, a fighting game that is available to play for free. The question that remains though, is free a good enough price to warrant a play? Ben 10 Alien Swarm: Swarm Smash has a simplistic plot. Ben needs to stop some Alien Swarm by smashing them to bits, so he is going to use the Humungousaur to smash them into bits. The game takes place in the same warehouse/factory throughout the game, with stronger enemies coming in at later levels, so that Ben can smash them into bits too. Without ever seeing the movie, it is suspected the game is based off of part of the movie where this same things happens, but it is hard to be sure. The story is told on single panels before and after the game proper, which makes sense for a game designed for a younger audience to play. Humungousaur is who the player plays as, since Ben is limited to only the single panel screens. Though there is no transition to let uninformed players know that Ben is actually changing into Humungousaur, so it fits that the game is mostly only for fans of the movie or series. But I digress, Humungousaur is outfitted with a basic attack set and a few special moves. One of the problems is that the game gives the player no information on how to perform the 3 different special moves, as they are all the same button, turns out they are context sensitive. 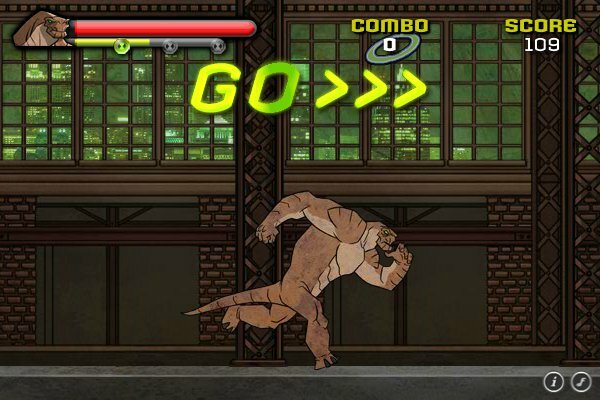 Humungousaur can punch, jump kick, uppercut, and tackle; however, if the player uses the special attack he can enlarge a lot and stomp on standing enemies, enlarge a bit and swat at enemies in the air, or enlarge a bit and swan dive on knocked down enemies. Attacking quickly will keep the combo going up, which improves the attack rating. 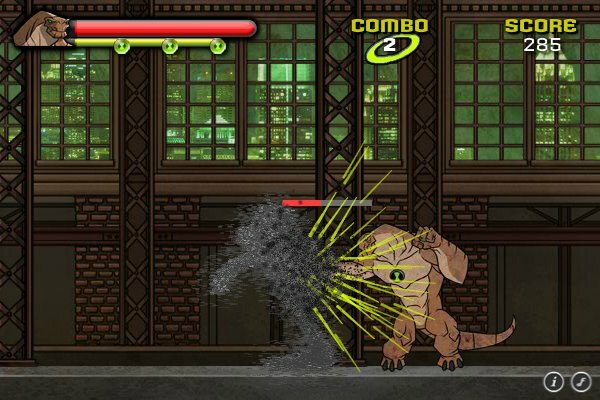 The defense rating is based on not getting hit, which starts out easy as enemies only punch at first and Humungousaur can overwhelm enemies fairly easily, but later enemies can actually throw projectiles that much be ducked. The technique rating is probably based on mixing things up with the different moves, but it is a little hard to tell. Score is based on several factors, so it is best to go for a high rating in each aspect to get a maximum score. 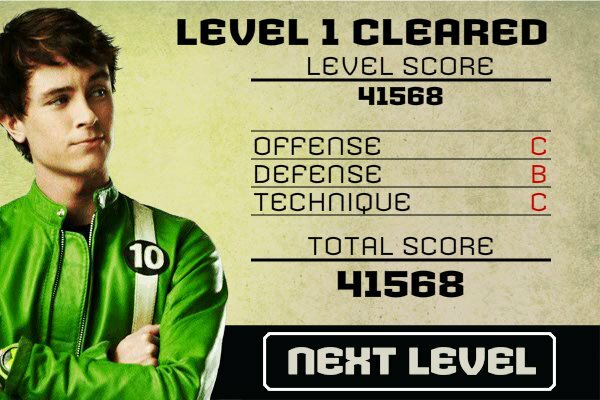 Scores can be submitted after completing the game, so excellent players can get on a highscores list. Ben 10 Alien Swarm: Swarm Smash is interesting in that the story panels focus on the live-action movie actor, but the game itself is more based on how the creatures look in the cartoon series. Both are alright, simply being oddly juxtaposed together in the same game. The music is all of two songs, the first being for the menu and combat song and the second being for the rating screen. The music does fit the subject, but it is a bit repetitive since as there are so few, though the game is fairly short, so players wont have to put up with it long or simply mute it. There isn’t any dialogue, which was weird as I thought they could at least have a line or two Ben is known to say before each section or at the end. For the most part, Ben 10 Alien Swarm: Swarm Smash is okay. It really only has the highscores going for it, but the scoring does seem fairly dynamic to ensure players can’t receive a “perfect” score and just all tie for first. The Cartoon Network website also has badges for the game, which are fairly simply so anyone that enjoys earning those can have a grand old time with that. For the most part though, it’s an average fighting game based on Ben 10, so if you happen to like both those things go ahead and check it out.